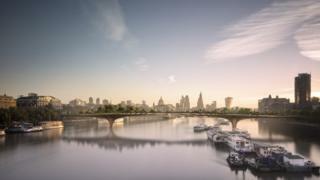 A £200m plan to build a bridge covered with trees over the River Thames in central London has officially been abandoned. The Garden Bridge Trust said it had failed to raise private funds since losing the support of the mayor of London, Sadiq Khan, in April. It comes after a review of the project recommended it be scrapped. At least £37.4m of public funds has already been spent on the project and a further £9m is at risk. In total, an estimated £46.4m of taxpayers' money - calculated as direct grants of about £26m from the Department of Transport (DfT), around £11m in services in kind from Transport for London (TfL) and the remainder in cancellation costs - has been spent, according to the review by Dame Margaret Hodge. Mr Khan said it was his "duty to ensure taxpayers' money was spent responsibly". "I have been clear since before I became mayor that no more London taxpayers' money should be spent on this project and when I took office I gave the Garden Bridge Trust time to try and address the multiple serious issues with it," he said. "Londoners will, like me, be very angry that London taxpayers have now lost tens of millions of pounds - committed by the previous mayor on a project that has amounted to nothing." The mayor also refused to provide a financial guarantee to cover ongoing maintenance of the bridge, estimated to cost about £3m a year, which the trust said would be covered by closing the bridge to the general public for 12 days a year so it could be rented to corporate clients . Foreign Secretary and former London mayor Boris Johnson accused Mr Khan of killing the Garden Bridge out of spite. "Labour has no vision for London and no ambition," he said. "The Garden Bridge was a beautiful project and could have been easily financed." The trust blamed losing the mayor's support for its inability to raise the necessary private funds to complete the project. It said all potential benefactors and trustees decided the project could not happen without the support of the mayor. But as early as January, the trust filed accounts for 2016 at Companies House in which its chairman Lord Davies admitted the project was not currently a "going concern" and that it had failed to raise any private funds since August 2016. The same accounts showed the trust had yet to secure the land on the South Bank of the Thames for the bridge's southern landing. By April, when the project lost Mr Khan's support, the trust had still not secured the land on the South Bank. In a letter to Mr Khan, Lord Davies said: "We are incredibly sad that we have not been able to make the dream of the Garden Bridge a reality and that the mayor does not feel able to continue with the support he initially gave us." He said the trust had raised £70m of private money towards the project and had satisfied most of the planning permission conditions. "The Garden Bridge would have been a unique place; a beautiful new green space in the heart of London, free to use and open to all, showcasing the best of British talent and innovation," Lord Davies said. "It is all the more disappointing because the trust was set up at the request of TfL, the organisation headed up by the mayor, to deliver the project. It is a sad day for London because it is sending out a message to the world that we can no longer deliver such exciting projects." This shambles is an embarrassing mess for the capital and it has already descended into finger pointing and a blame game over who is culpable for wasting £46.4m of public money. The trust blames the current mayor Sadiq Khan for not giving guarantees over maintenance. He blames the previous mayor Boris Johnson for backing a scheme financially that was not value for money, while Mr Johnson says it was up to the current mayor to make it work. Ultimately this project was not absolutely vital - it was more a tourist attraction - and was born in a different age when London's transport budget was not as constrained. And I think it got off to a dreadful start back in 2013 - when I started covering this - by crucially not asking locals if they wanted it. Infrastructure needs political consensus, as projects span many parties and leaders, and the Garden Bridge never enjoyed that. Monday's London Evening Standard, edited by former Conservative chancellor George Osborne, also blamed Mr Khan for the collapse of the Garden Bridge project. In October the National Audit Office (NAO) revealed former prime minister David Cameron had personally intervened to approve extra taxpayer funding for the controversial project, against the advice of his own civil servants. A ministerial direction - which a senior civil servant may ask a minister for to show he or she is ignoring the advice offered - was issued after cabinet secretary Sir Jeremy Heywood wrote to the Department for Transport expressing the "frustration" of both Mr Cameron and Mr Osborne at perceived hold-ups to the funding during 2015 and 2016. The NAO added an initial commitment to provide £30m of taxpayers' money was made by Mr Osborne to Mr Khan's predecessor, Boris Johnson, without any DfT involvement. A review of whether the Garden Bridge offered taxpayers value for money was launched at about the same time the NAO report was released. Conducted by Dame Margaret Hodge, the former chair of the House of Commons Public Accounts Committee and MP for Barking, the review recommended in April that the project should be scrapped. Andrew Boff, Conservative London Assembly member, said Mr Khan had wasted £9m in taxpayers' money as he could have scrapped the project as early as May of last year. Thomas Heatherwick, who designed the bridge, said: "Our cities need optimistic, amazing people (who supported the project) like this. And London needs new bridges and unexpected new public places.